Each student will be encouraged to submit his or her creative works to appear in the talent showcase. The Showcase is broken into four categories including video / film, audio / music, images / art and literature. The video / film section will host videos showing any talents that NHSA students have, for example, singing, acting, film making, dancing and playing a musical instrument. They can also showcase any other talent that they may have including sports, martial arts or breaking a world record on a pogo stick. A link to each of the students showcases will be placed on his or her Profile Page so that they can take pride in their accomplishments and so others, who visit their profile, can be inspired, enlightened and entertained. 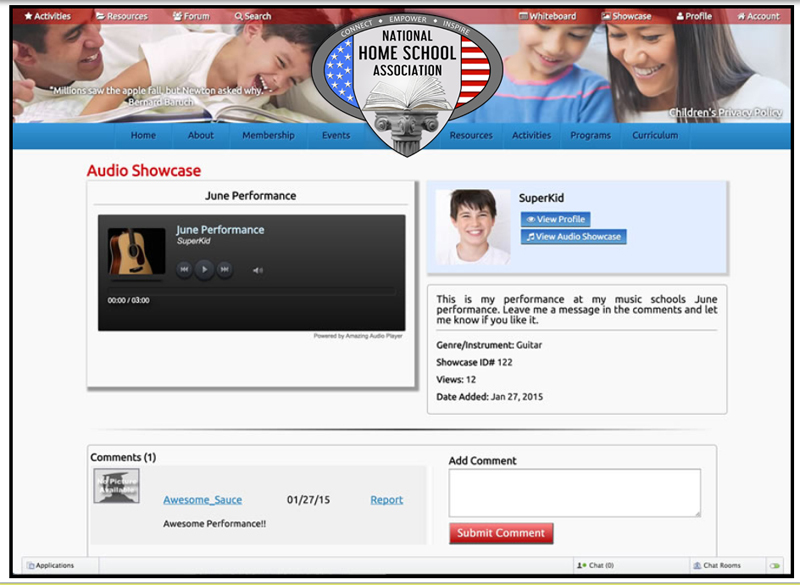 When students upload an entry into the showcase they have the ability to allow or deny comments.